Details of Plastic Laminated Watchkeeping or Watch Keeping Forms for sailing yachts motor yachts and boats. Rotas Systems and schedules for watchkeeping or watch keeping at sea. Forms to help you quickly and easily create a Watchkeeping Rota for your voyage. Watchkeeping Rota for two crew members. Use this form to fill basic details of the voyage and specific details of the crew and their sailing experience. The main part of the form allows for full details of the agreed watchkeeping schedule for a period of two days to be inserted for 2 crew members. Available in size A4: Grey or Colour background. 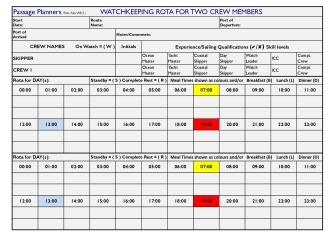 Watchkeeping Rota for two crew members - Continuation Sheet. On the reverse side, there is a sheet for a further three days continuation. The forms are heat encapsulated within a premium matt plastic A4 size pouch which allows for details to be written using a 2HB pencil. Details may be altered as required by erasing and re-entering. There is plenty of space on each line to allow easy entering of detail. Use time and time again. 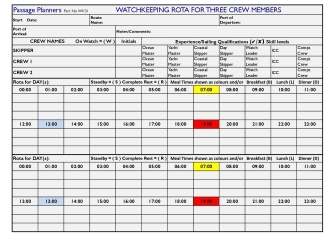 Watchkeeping Rota for three crew members. Use this form to fill basic details of the voyage and specific details of the crew and their sailing experience. The main part of the form allows for full details of the agreed watchkeeping schedule for a period of two days to be inserted for up to 3 crew members. 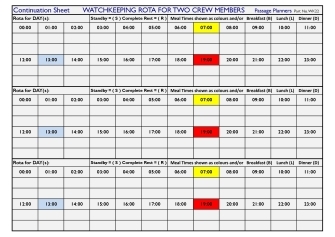 Watchkeeping Rota for three crew members - Continuation Sheet. 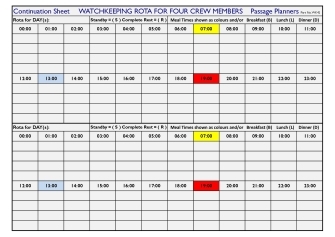 Watchkeeping Rota for four crew members. Use this form to fill basic details of the voyage and specific details of the crew and their sailing experience. The main part of the form allows for full details of the agreed watchkeeping schedule for a period of one day to be inserted for up to 4 crew members. 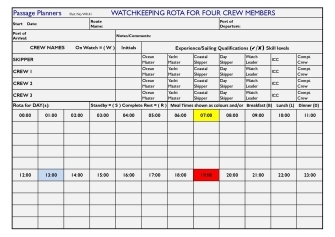 Watchkeeping Rota for four crew members - Continuation Sheet. On the reverse side, there is a sheet for a further two days continuation. 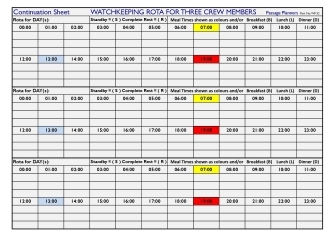 Watchkeeping Rota for five crew members. Use this form to fill basic details of the voyage and specific details of the crew and their sailing experience. 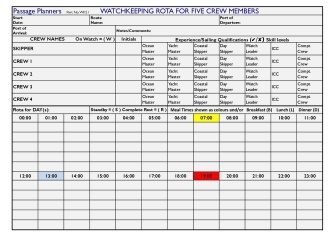 The main part of the form allows for full details of the agreed watchkeeping schedule for a period of one day to be inserted for up to 5 crew members. 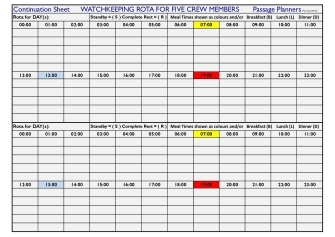 Watchkeeping Rota for five crew members - Continuation Sheet. Watchkeeping Rota for six crew members. Use this form to fill basic details of the voyage and specific details of the crew and their sailing experience. The main part of the form allows for full details of the agreed watchkeeping schedule for a period of one day to be inserted for up to 6 crew members. 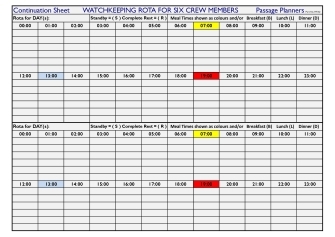 Watchkeeping Rota for six crew members - Continuation Sheet.